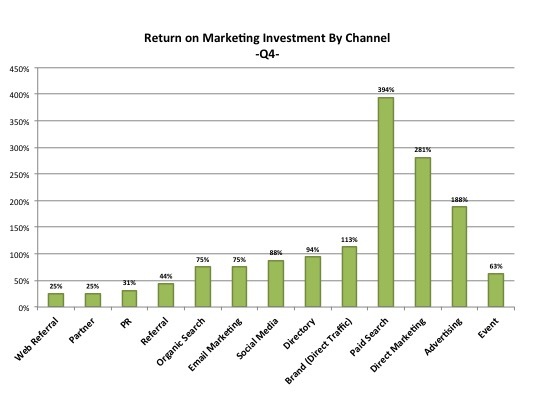 WHERE SHOULD MARKETING INVEST ITS MONEY AND TIME? This is the third post in a series on reporting. The first post focused on performance metrics worthy of board reporting. The second post revealed the reports that highlight points of revenue leakage. With performance reporting and an efficient funnel in place, Marketing is now ready to ask “where should we invest our money and time?”. Assets – are offers presented to prospects to get them to take action (these range from ebooks to trials to $ off promotions). These call-to-actions are typically closely aligned with a campaign theme. To succeed, a marketing team has to make the right calls in each of these four categories. No one gets it right the first time. That’s why it is important to have robust reporting in place. With the right reports you can quickly figure out what is working and jettison whatever isn’t. In the following section, we share the best reports to answer Marketing’s ‘investment’ questions. Below we offer three core reports. While we focus on “Channels” in each report, you should recreate each of these reports for each of your marketing levers mentioned above (campaigns, assets, sources & channels). This report tracks the closed-won sales for all deals and categorizes them by channel. 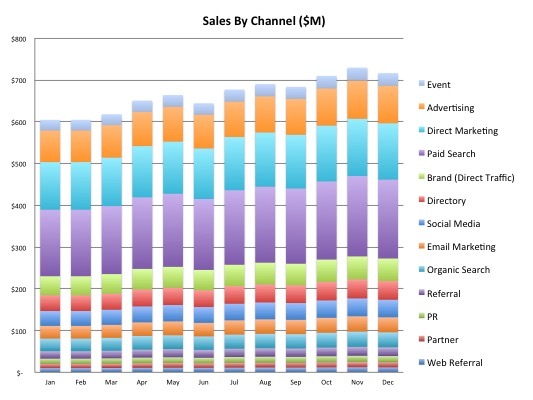 Depending on the length of your salescycle, a quarterly snapshot should provide a clear sense as to which channels are most effective for sourcing your leads. Assuming that you’ve given each channel your best shot, you should be doubling down on those channels that bring in the lion’s share of your revenue. If you don’t have the luxury or technical ability to trace channel through to closed-won deals, then consider using weighted pipeline as a proxy. If pipeline is unavailable, then you can use volume of sales accepted leads (SAL’s) or marketing qualified leads (MQL’s). Similarly, if you face a long sales cycle, you may not be able to wait until sales deals close to inform your decision making. In those instances you may want to use pipeline or even MQL’s by channel to get early insights. 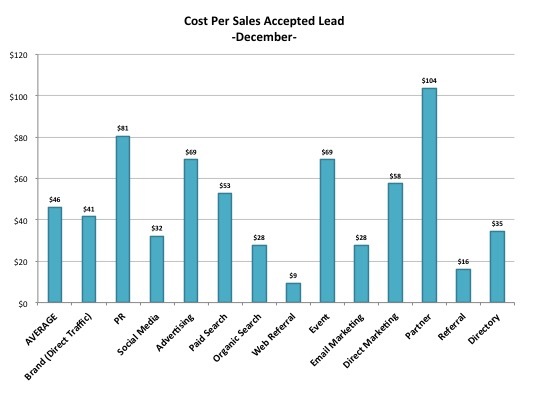 In this example we are looking at the cost per sales accepted lead (SAL) by channel. Once you have a good sense of your average cost and the maximum acceptable cost, you can evaluate if any of your channels are simply too expensive to pursue. Make sure that when you compute your expenses you include the fully loaded costs of people’s time on your team. For instance Social Media may require a full time head count whereas Organic Search may require only a couple of hours a month. In addition to evaluating channel performance, this report should be run by campaign, source and asset. You may find, for instance, that a particular asset that was very expensive to produce actually has a very low cost per lead due to the high prospect take rate. Return on Marketing Investment (ROMI) is the Holy Grail. This number indicates if your marketing efforts are accretive to the value of your company. Marketers sometimes find it hard to measure this since their campaign attribution data resides in a different system from their sales data. In fact, more than half (56%) of marketers said that their top challenge is attributing program spend to revenue according to a 2016 survey by Forrester. Have no fear. This is a solvable problem. This post assumes that you have solved this technical problem. If you haven’t, ping us and we’ll show you how. You’ll want to evaluate your ROMI for each of your channels (and sources, campaigns & assets). Make sure that you fully load all cost information into your calculations accounting for both direct costs (like advertising expenditure) and indirect costs (like the % of someone’s time spent which should be a dollar value based on the person’s fully loaded compensation). You’ll want to minimize your investment in channels that have a ROI substantially less than 100%. They are a drain on profits and they are a drag on your team’s performance. Increase your investment in channels that have an ROI greater than 100%. As mentioned, each of the aforementioned reports should be created and monitored for all 4 marketing levers (campaigns, assets, sources & channels). Fortunately, in today’s digital age, tools and methodologies exist today to create each of these reports. Please share some of your favorite tools in the comments section below.